Activate The CB1 and CB2 Receptors In The Brain And Nourish Your Endocannabinoid System! Everyday is our pure, organic, Kentucky-grown, farm fresh full-spectrum hemp derivative infused in organic Hemp Seed oil, Copaiba Essential Oil, Frankincense Essential Oil, and Peppermint Essential Oil. 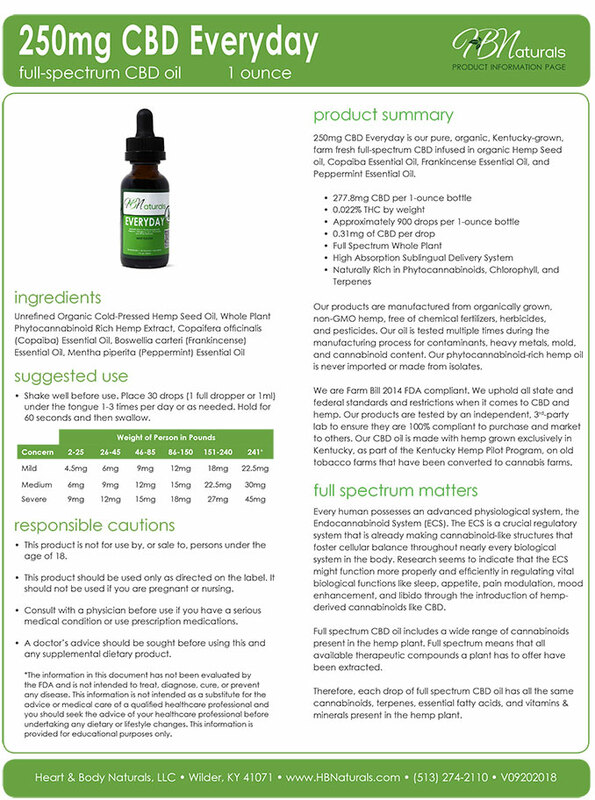 This full-spectrum tincture is a great way to start your health and wellness regimen. Ideal for beginners and veteran users alike in a convenient 1-ounce bottle for a quick, simple way to take wherever you are. Everyday has a deep green color and fresh, minty flavor from the Peppermint essential oil; you can taste the goodness in every drop. The Copaiba essential oil strengthens the cannabinoids. Copaiba: We all have cannabinoid receptors found in our brain, organs, tissues, glands, and immune cells. Two types of receptors, CB1 and CB2, are present in many tissues although each is linked to a different action within the body. CB1 receptors interact with THC (the active constituent in marijuana) and cause psychotropic effects. CB2 receptors, the target of both full spectrum hemp derivative oil and Copaiba essential oil, don't make you "high" when affected. Found mostly in the immune system, CB2 receptors assist with inflammation and certain kinds of pain when affected by cannabinoids. Unlike full spectrum hemp derivative oil, which can contain varying amounts, Copaiba essential oil contains 0% psychoactive hemp derivative. Copaiba oil contains high levels of beta-caryophyllene (BCP), a cannabinoid that interacts directly with the CB2 receptors in our body and may be neuroprotective and have cardiovascular and immune benefits. Beta-caryophyllene is also found, in lower levels, in other essential oils like Black Pepper and Melissa. Frankincense: In the last few years, Western science has become aware of the ability of Frankincense to lessen the pain caused by rheumatism. A study conducted at the University of Munich was able to prove the effects of Frankincense on joint pain. The age-old healing and incense-burning substance can give many people who suffer from rheumatism hope and help. Other experiments, conducted at the University of Tubingen have also proven that Frankincense can reduce infections. According to pharmacological research, Frankincense has strong anti-inflammatory properties that could make it a natural remedy for arthritis, rheumatism, psoriasis, and asthma. Peppermint: Unlike many other herbs and essential oils, numerous health benefits of Peppermint leaves and Peppermint essential oil have been studied and proven by the scientific community. Peppermint essential oil is a mental as well as a physical stimulant. Peppermint contains nine expectorant compounds that help move mucus up and out of the lungs. Its main constituent, menthol, thins mucus, making the expectoration easier. Peppermint also contains antiseptic, antibacterial, antiviral, and antimicrobial compounds making it effective with gingivitis, colds and flu, and respiratory concerns.